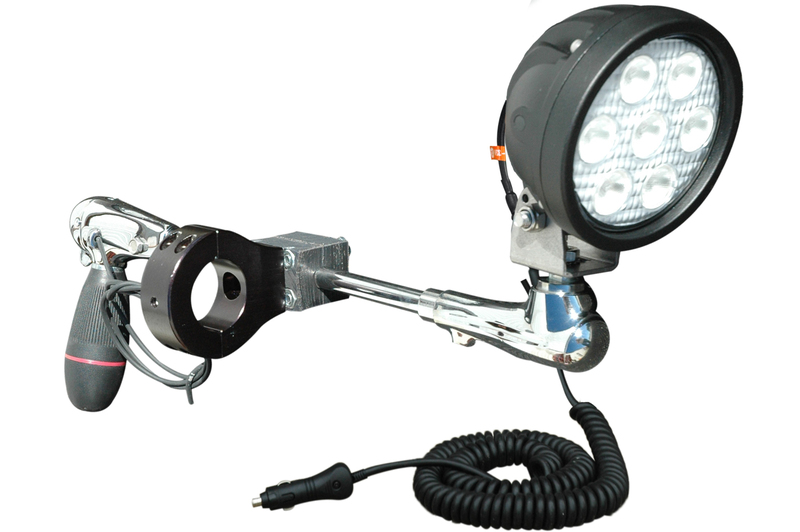 Larson Electronics has announced the release of a powerful new LED spotlight designed to mount to the rails, cages and roll bars commonly found on marine craft and utility and all-terrain vehicles. The BCML-LED-21R bar clamp mounted spotlight offers high light output in a durable, low profile housing and operates on any voltage from 9 to 32 volts. The BCML-LED-21R LED bar clamp mount spotlight from Larson Electronics is an ideal lighting solution for hunters, outdoorsmen, military, and law enforcement professionals who desire a powerful spotlight that can be easily operated while providing high power and rugged durability. This LED spotlight produces a 575’ long by 45’ wide light beam with 1750 lumens of bright light while drawing only 21 watts. The seven Edison Edixeon Emitters containing CREE EZBright three watt LEDs produces 180 lumens each and is paired with high purity 10° optics to produce a tightly focused spot beam with limited spread. These bar clamp mount spotlights are IP67 rated and waterproof to one meter, sealed against intrusion by dust and dirt and ruggedly constructed to withstand demanding environments and applications. It is constructed of extruded aluminum and features rubber isolated mounts and unbreakable polycarbonate lenses to provide durability and resistance to vibrations, impacts, waves, hard rains, sand and high winds. The BCML-LED-21R is mounted on the end of a 10” shaft. An aluminum bar clamp is also mounted to the shaft to simplify mounting. The top portion of the mount has a through hole that enables the operator to pass one of two ¼ -20 bolts through it and secure that stud with a Nylock nut. Small machine screws secure the bottom half of the clamp to the top portion. The installer simply affixes the light to the top portion and places the assembly on the rail or bar. The bottom portion is positioned and secured with the machine screws, cinching the clamp tightly to the bar. Larson Electronics carries an extensive line of LED spotlights, LED hunting lights, colored LED lights, portable work lights and industrial grade LED area lights. You can view Larson Electronics’ entire line of lighting by visiting them on the web at LarsonElectronics.com. You can also call 1-800-369-6671 to learn more about all of Larson Electronics’ lighting products or call 1-214-616-6180 for international inquires.